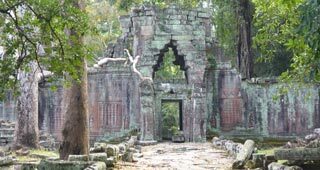 Outside the core temples of the small and big circuits, there are some great temples and things to do in the area. 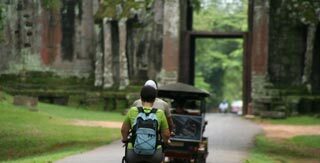 You could choose a few (or possibly all if you don't hang around) of these great sites to visit in a day. 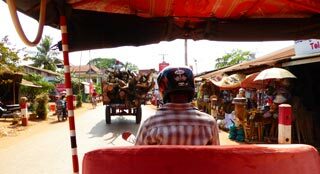 One great thing about heading to the attractions further afield is you get to drive through rural Cambodia; small villages, rural houses, crazy things being transported by various contraptions, farmers tending their fields etc. It can be as much fun that the sights you are going to see. 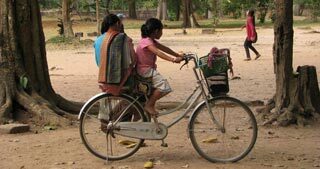 A - Start We have started in Siem Reap, but there is a road East from Bayon connecting to the main highway 67, which the first few sights are on if you were doing as part of another circuit. 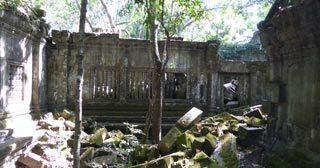 B - Banteay Samre Built by King Suryavarman II in the late 20th century and had extensive renovation from 1936 to 1944. 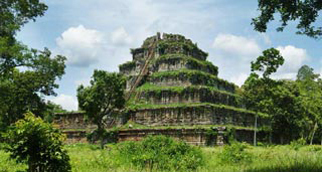 It has elaborate architecture and carvings but has been the victim of a fair bit of looting. 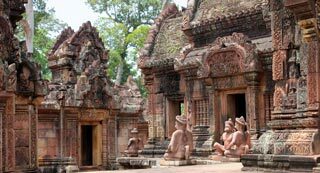 Not as spectacular as Banteay Srei the sites biggest appeal is that tours don't come here, so it's very peaceful and quiet. 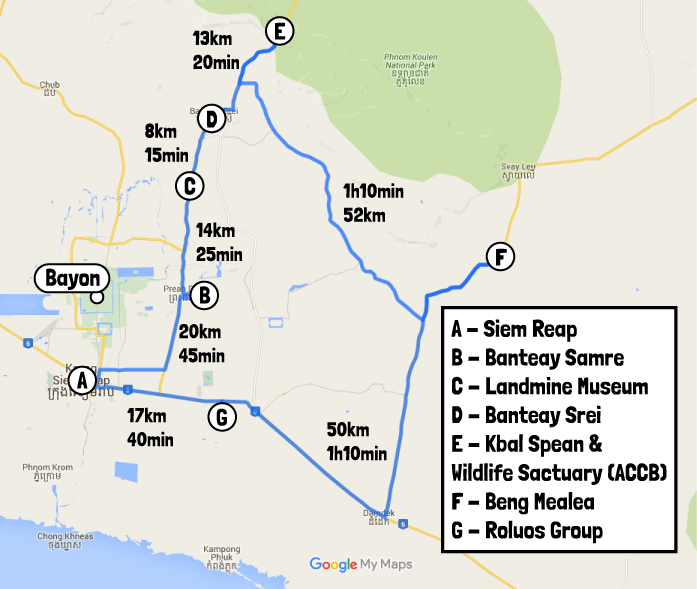 Open 5:00am to 6:00pm and entrance is with your Angkor pass C - Landmine Museum Run by an NGO Started by former Khmer Rouge child solider and is a great place to learn the vast impact landmines have had and still have on Cambodian life. All the proceeds go to care for the 20+ young people in the orphanage plus many other great local causes. Open 7:30am to 5:30pm every day. D - Banteay Srei Translated as 'Citadel of Women' after all the intricate apsara (heavenly nymphs) carvings, this is one of Angkor's finest temples with its stunning carvings in the pink-hued sandstone. 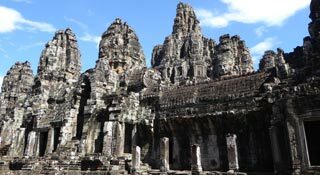 Open 5:00am to 5:00pm and entrance is with your Angkor Pass. E - Kbal Spean Set deep in the jungle the name means 'bridgehead' after the natural rock bridge at the site. The more common English name is 'River of a Thousand Lingas' after the spectacularly carved riverbed. It's a 2km (35min) walk through the jungle from the carpark to the riverbed. There is also a nice 3m waterfall you can stand under to cool off, be careful as the rocks are covered in slippery algae. The stream itself isn't deep enough for swimming, just a paddle. 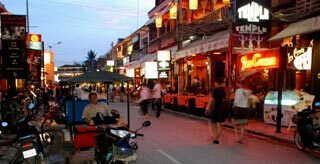 It's a bumpy ride here in a tuk-tuk, once here there are clean toilets and some restaurants at the carpark. 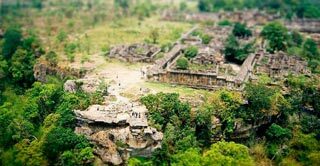 Open 5:00am to 3:00pm and entrance is with your Angkor Pass.. E - ACCB Providing sanctuary for rescued animals, breeding and rehabilitation programs. They have a very broad variety of species of mammals, birds and reptiles. This is a rehabilitation centre, not a zoo, so it's good to get one of the twice daily tours (9am and 1pm, mon-sat, min US$3 donation per person) by one of the knowledgeable and friendly staff. F - Beng Mealea A huge half collapsed temple ravaged by the forest. You can climb through it with one of the caretakers on hand for an Indiana Jones explorer experience. 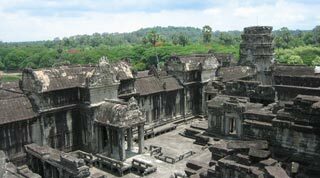 Alternatively, you can walk round the temple on gangways built around the temple. It's well worth the trip out here. 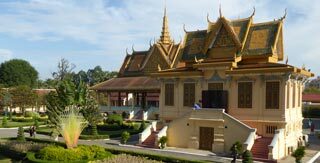 Open 5:00am to 6:00pm and entrance is US$5.. G - Roluos Group Consists of three temples Bakong, Lolei and Preah Ko. 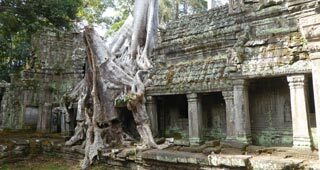 Dated from the late 9th century, this is the earliest built of the Angkor temples that can be visited and was the early Khmer capital. The building has a distinguishing feature of square towers, with one door open to the east and 3 false doors on the other sides. These temples are also relatively quiet most of the day. 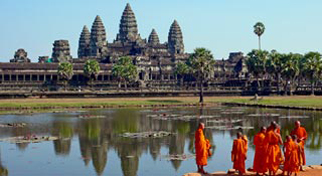 Open 5:00am to 6:00pm and entrance is with your Angkor Pass.